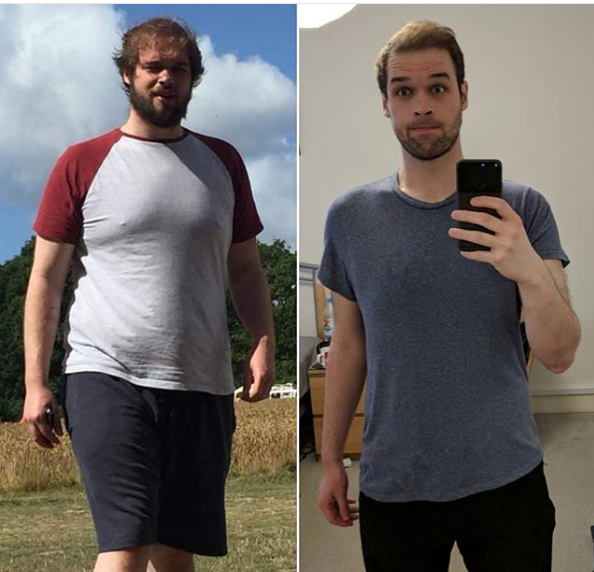 So, I've done really well and lost a lot of weight (yay!). Last summer I was ~280 pounds, and I started with a vegetarian diet and calorie counting but didn't go about it in a very good way. I would eat under budget some days, but then eat up the deficit on the weekends, and was over-estimating my exercise calories so progress was slow. I'm not sure how much I lost over this period because to be honest, I didn't want to weigh myself. I made some progress, but It wasn't until the beginning of this year that I started taking things seriously – I've gone from having an obese BMI to a healthy one in the last few months. I appreciate this may seem like I've done things drastically, and in some ways I have. But I've been balancing my macronutrients, getting plenty of protein, and eating a healthy but nutritious diet (lots of eggs, chicken, peanut butter, veggies, had carbs but not too many, tried to keep the fats 'good ones', salads and general healthier choices and alternatives). And I have had my treats. Plenty of pub trips, some McDonald's, pizzas, TGI Fridays, Nandos, even a Chinese all you can eat (although when I was there I ate mainly vegetables because not being able to properly log what I was eating made me nervous!). But when I have, I've planned for them accordingly and had a 3-4000 weekly deficit on top of LoseIt's two-pound-a-week numbers the weeks where these have happened. On average, I'd say I've been having 1200-1500 calories a day, with one 2000 calorie day a week and the occasional indulgence day. Swimming four times a week, and walking at least 7,500 steps a day. As of yesterday, I weighed 193 pounds and I'm 6 foot 3. I'm SO, SO, proud of what I've done. And I can't really believe that I am less than a stone from my personal goal weight. I want to start to transition to muscle building, but am also comfortable with slowing down my progress for these final pounds as I start to transition to maintenance calories. I've had a big, tough week this week (it's positive, I've essentially had two job interviews and been offered both of them, so have a difficult decision coming up!) and I decided that I'm going to try and eat at maintenance this weekend, with some treats. I've got myself some pringles (rice infusions, so less than 500 calories for the tube still), a tub of Breyers ice cream, and am totally intending to have a nice big McDonald's this evening. Tomorrow, I'll go swimming but eat back some of those calories and shoot close to maintenance, but try to do it with 'healthy' food. I'm doing this because I recognise I need to change my attitude towards how much I'm eating, because I think I could be in danger of developing an eating disorder. Seeing the weight fly off so quickly (and relatively simply, to be honest) has kept me super motivated to keep going. I still have some unwanted flab and fat around my belly and my hips that I want to get rid of, but I'm happy with my body and I want to try and change my approach to losing this last bit. Does anyone have any advice for going forward? Right now the prospect of eating at maintenance scares me, because there's a thought at the back of my head that I'm going to put all the weight back on – even though I know and have seen how the maths of CICO works! I've lost weight before, but never this much, and I've always piled it back on pretty quickly but this time has to be different so I want to approach it properly. For those of you who had similar experiences, how did you start to slow your weight loss and change your mentality? Did you just slowly up your intake, or did you wait until you hit your goal and enjoyed the glorious extra 1000ish calories in one hit? Do you allow yourself more treats (as long as they fit into your daily intake)? Do you stick to the exact same things you have been eating, just more of them? Any general advice or experiences/anecdotes would be much appreciated!